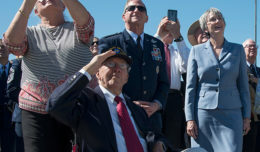 U.S. and Iceland honoured the crew of B-52 Liberator ‘Hot Stuff’ monument dedication ceremony on the 75th anniversary of it crashing in Iceland during a heavy storm. All but one passenger on board were killed to include famous World War II Lt. Gen. Frank Maxwell Andrews. As two of the founding nations of NATO, Iceland and the U.S. continue their long and enduring relationship of seamless cooperation as allies. 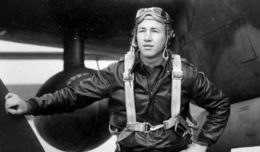 May 3, 2018, marked the 75th anniversary of the death of, Lt. Gen. Frank Maxwell Andrews, and the crew of the B-24 Liberator “Hot Stuff,” the first heavy bomber in the 8th Air Force to complete 25 missions. “Their sacrifice and commitment to a cause far greater than themselves represents the proud heritage and tradition of honour that is the core identity of today’s U.S. Air Force,” said Lt. Gen. Richard M. Clark, 3rd Air Force commander. Clark, joined by Col. E. John Teichert, Joint Base Andrews commander, members of the U.S. Air Force along with Icelandic counterparts Gudlaugur Thór Thórdarson, Iceland Minister of Foreign Affairs, Porsteinn and Olafur Marteinsson (originators for the dedication idea) attended a monument dedication to those who perished 75 years ago. The B-24 liberator crashed on the side of Mt. Fagradalsfjall in Grindavikurvegur, Iceland, due to severe weather conditions on their way back to the United States. 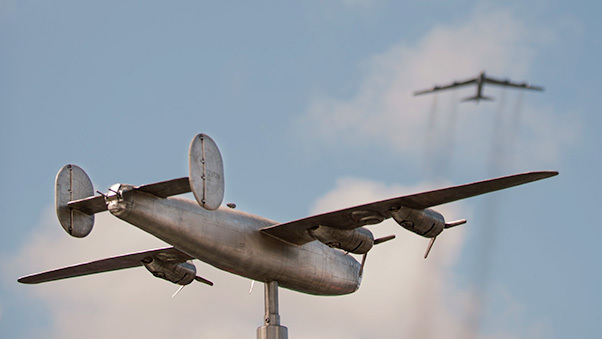 The monument sits at the base of the mountain adorned with a model of their aircraft and inscribed with the names of those impacted that day as a way of ensuring the sacrifices made would not be forgotten. “The names of Frank Andrews, the crew and passengers of ‘Hot Stuff’ do live on and have been raised to the forefront of our minds in thanks to the efforts of Jim Lux and the ‘Hot Stuff’ organization,” said Clark. 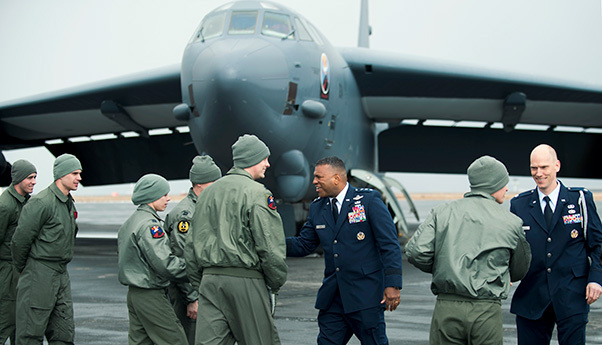 Lt. Gen. Richard Clark, 3rd Air Force commander, welcomes the crew of a United State Air Force B-52 Stratofortress, deployed from Minot Air Force Base, N.D., after a ceremonial flyover for a monument dedication to honor the crew of the B-24 Liberator “Hot Stuff” at Keflavic Air Station, Iceland, May 3, 2018. As the “gateway to the Arctic,” Iceland serves as an important transit point to over 1,000 U.S., NATO military and government aircraft each year traveling between Europe and North America. The crew of the B-24 Liberator “Hot Stuff” had been ordered back to the United States to tour the country and help sell war bonds as reward for being the first to complete 25 missions; a job later done by the well-known “Memphis Belle.” “Hot Stuff” was on its way home when it attempted to make a scheduled refueling stop. The crash resulted in the deaths of all on board, except the tail gunner, Sgt. George Eisel. Andrews, considered one the greatest military leaders in U.S. history and the “Father of the Air Force,” was to be notified on the very day he died that he had been selected to command the Allied Forces for the eventual invasion of Europe. Andrews never received the message and the job would later be assigned to Gen. Dwight D. Eisenhower following Andrews’s death. “To see the local community come out in such large numbers, especially braving the wind and the cold, to pay tribute to men they never met, really just shows you how close our two countries are. As a member of the Air Force it means a lot personally to see that type of support,” said Staff Sgt. Jordan Schraner, a member of the 52nd Fighter Wing’s Ceremonial Guard based at Spangdahlem Air Base, Germany. The U.S. remains strong in its partnership with Iceland and believes moments like this that show the true commitment each country shares.